Test driving a car is one of the more abstract and subjective parts of the buying process. Many other questions are answered purely by numbers – how much a car costs to buy, how much it’ll cost to run, how much you’ll lose in depreciation and so on. 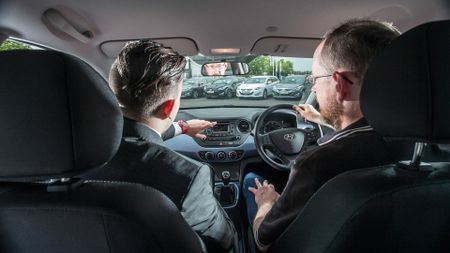 Test driving, however, is the one and only time you’ll be able to gauge how a car ‘feels’ before you part with your hard-earned and actually have to live with the car. This makes it one of the most important things you’ll do when researching your new car, but it’s also one of the most neglected parts of the process. Often, buyers will just take the car out on a cursory spin around the block before settling on it (or not). While this is better than nothing, it’s simply not enough. As with so much in the car-buying process, preparation is crucial. First of all, have a very clear idea of which car you’re interested in before you even set foot in the dealership; and, once you’re there, don’t allow yourself to be coerced into driving a much more expensive version of the car you fancy. Firstly, it might give you unrealistic expectations of what the car you’re actually interested in might be like; and, secondly, you might end up spending more than you’d like to get all the flashy features from the model that you’ve test driven. If you can’t test exactly the car you had your eye on, then concentrate on getting in a car with the engine and transmission that you want. These will have the biggest effect on how much you enjoy the car and how suitable it is for you in everyday use. Then, before you set off, make sure you can get comfortable – with the seat and steering wheel aligned properly with the pedals. An awkward driving position is one of the biggest causes of back pain among drivers and can seriously colour your view of a car. In an Auto Trader Expert Review, we judge a car on ten different attributes – exterior styling, interior, practicality, ride and handling, performance, safety, equipment levels, running costs and that all-important ‘why buy’ – and on the test drive, it doesn’t matter if you’re looking at a city car or supercar, the process is pretty much the same; you’re just prioritising different elements of the car. If you’re after a family car, then practicality, safety and running costs will probably be your main concerns, while someone after a sportscar will want the best levels of performance and handling. However, if you need a family car, but still want it to drive nicely, then you should bump this up your priority list. It’s also important to put these things into some sort of context, so while a city car is never going to have scorching performance, it’s important that it can pull out sharply from a junction and sit easily at motorway speeds. Also, while a sportscar won’t be as practical as a family car, you might still want to fit your shopping in there occasionally or have room for enough luggage for a weekend away. Remember to take along with you at least some of the stuff that you often carry in the car – such as children and all their paraphernalia, including car seats. This will give you a much better understanding of how easy it is to get things in and out. Likewise, if it’s a concern to you, now’s the time to ensure that your phone can work with the car’s systems. It’s also important to make yourself familiar with all the major controls. How easy are they to use? Can you reach them from your preferred driving position? Remember, what can seem a minor irritation on a test drive can become a major gripe over time, so it’s very important that you feel comfortable with all the controls. Last, but not least, be sure to get as much time in the car as possible, and take it on roads that you’re familiar with – or that at least ape the kind of conditions you regularly drive in. This will allow you to concentrate on the car, rather than on finding your way, as well as giving you a more accurate feel of what the car will be like if and when you actually come to own it. You’ll generally have to be accompanied on a test drive, so it’s worth taking another adult along with you to keep the salesperson chatting so you can concentrate on the car. Given that you’re buying a new car, one thing you shouldn’t have to worry too much about are any mechanical maladies. Instead, you can just concentrate on making sure that it suits you and your needs.